While it’s true that Charlie Sheen sucked up a lot of airtime last week, I’d been watching Glenn Beck, the Fox News host who invoked Hezbollah, socialists, the price of gas, Shariah law, George Soros, Planned Parenthood, and, yes, Charlie Sheen, as he predicted a coming apocalypse. Today Beck was not on his radio show, but his substitute claimed that the New York Times article was just “wishful thinking” and that Beck and Fox News are, in fact, on good terms. Beck’s website The Blaze is running an article at the top of their home page which makes fun of Carr’s article. However, none of the factual assertions in Carr’s article are actually refuted The Blaze response. Of course, the one group who actually knows the truth are the executive of Fox News. Thus far no one at Fox News has released a statement either confirming or denying Beck contract, or Carr’s claims that the network is thinking about dumping Beck. Fox News normally offers a strong defense of their own employees. Fox News President Roger Ailes has been known to send out memos stressing the need fo unity among their employees. By not saying anything at all, the silence of Fox News executives may speak louder than words. However, Carr later points out that Beck “still has numbers that just about any cable news host would envy and, with about two million viewers a night, outdraws all his competition combined.” One might think that would be the beginning and the end of the speculation, since what more should a television show be expected to do besides get more eyeballs watching them than any other show? However, Carr raises a separate intriguing point: not only does Fox not need Beck to continue to be successful, but Beck doesn’t really need Fox either. Therefore, unless both sides are completely happy with the relationship, maybe a separation is possible? Then, just in case the article is completely wrong, Carr mentions “But the partnership, which has been good for both parties, may yet be repaired.” In other words, yes Beck and Fox News can survive without one another, but since the relationship is highly profitable and consistently headline generating for all involved, might Carr’s conjecture be nothing more than an attempt to stir the pot? Beck, Carr guesses, is narrowing his audience down to only the diehards — because most people don’t want to hear about how the world is going to end. Not only because it’s depressing, but also since the world is not going to end. While other Fox News hosts like Bill O’Reilly and Sean Hannity are lecturing to an audience that believes in America, Beck is talking to people who don’t believe in anything — except, perhaps, God and the end of days. Carr spoke with several Fox News executives who said (on background, of course) that “they are looking at the end of his contract in December and contemplating life without Mr. Beck.” One Fox development VP is on record saying they’ve tried to get Beck to make his show cheerier. But no one, not even Fox’s crack publicity team, is quoted defending the controversial host — or insisting that his contract will be renewed. Which means that Beck, who can see doom in every shadow, is probably getting this message loud and clear: Something could very well come to an end within the year, and it won’t necessarily be the world. How about Rick Sanchez’s anti-Semitic spew when CNN canceled his show? How about CNN’s Operation Tailwinds story? How about CNN hiring Client No. 9 to begin with? There are only about a dozen minutes of advertising a show. Any media expert knows this. Any amateur knows this. Apparently David Carr does not. And left out of David Carr’s story is the fact that the White House — through New York Times darling Van Jones — organized an advertising boycott. 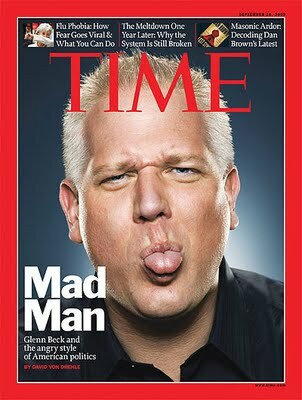 Of people who don’t advertise on the Glenn Beck show. The more the media dumps on Fox News over gnats while allowing CNN’s elephants to escape, the less unbiased the media look. Keep thinking you know it all, lefties. Beck’s problem is that he took the “oooh I’m scared of Obama (and his black skin)” sentiment and thought it was a way to make himself into a national leader of more than just a fringe of the fringe. As a result, he’s made his conspiracies even more ridiculous and tried the patience of even the tinfoil-hat brigade.